﻿ The BOB Hostel, Bangkok | FROM $5 - SAVE ON AGODA! 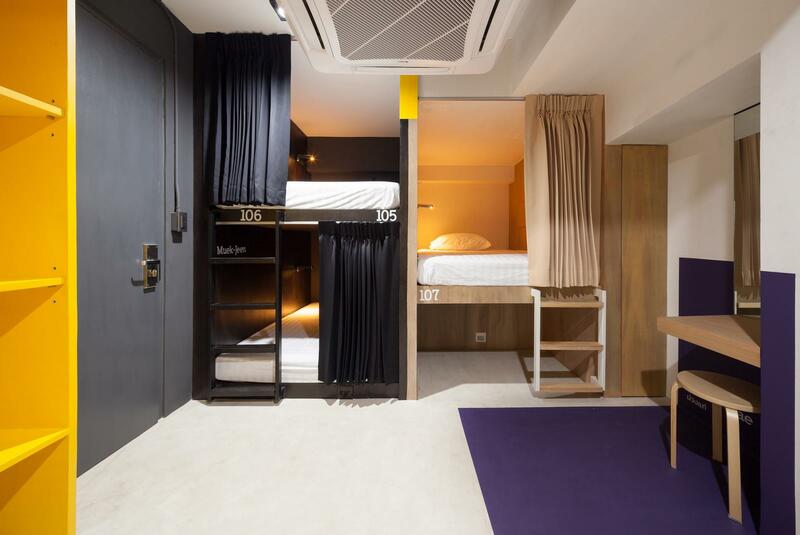 "It's an affordable and modern hostel in the Watthana distric..."
Have a question for The BOB Hostel? "Very clean, comfort and suitable for family with kids..."
"Staff very good,courteous and helpful." "We stay here one night, four aldult at 4th floor room, room..."
Visit the BOB Hostel and experience all that Bangkok has to offer. The rooms here overlook the city, so you can peer out at the lively city roads. 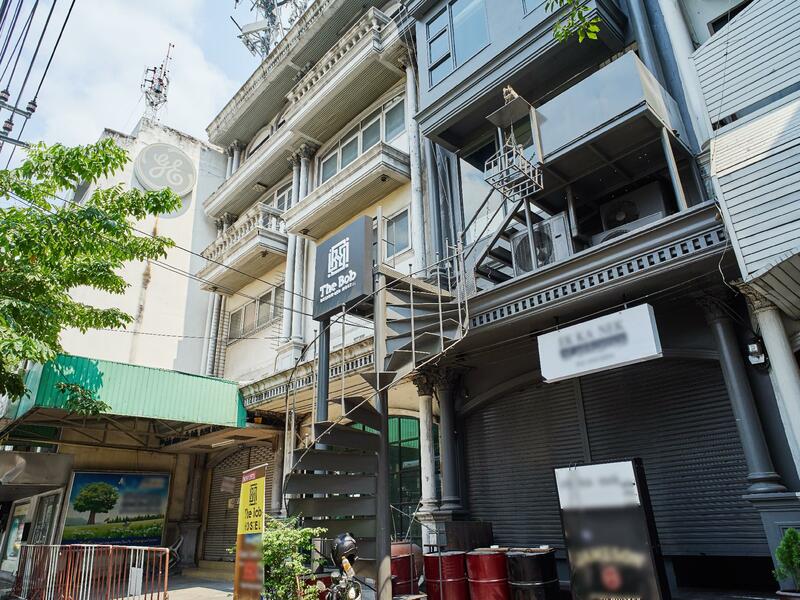 This hostel is near Bangkok Farmer's Market, Bangkok Bobble Football, The Eight, Thonglor, J Avenue, Thonglor, and Maze Thonglor. It features a bar and restaurants on-site, so there is an assortment of dining and snacking choices for guests to enjoy. 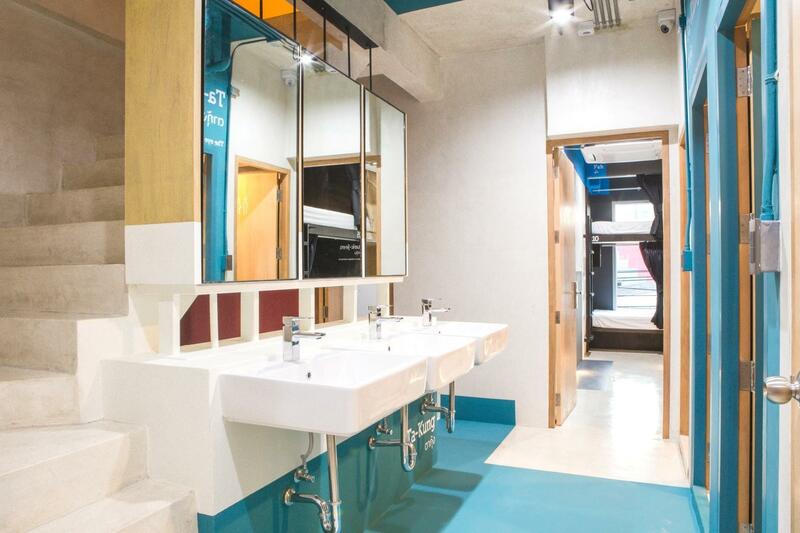 The BOB Hostel has various convenient features, such as a chapel and a smoking area. It has a selection of facilities for you to make use of throughout your stay, such as a garden and ticket services. It offers family rooms for those who wish to keep the whole family together when traveling with their children. There's free Wi-Fi available in all rooms, as well as Wi-Fi in common areas, allowing you to access the internet without overspending on data and roaming costs. 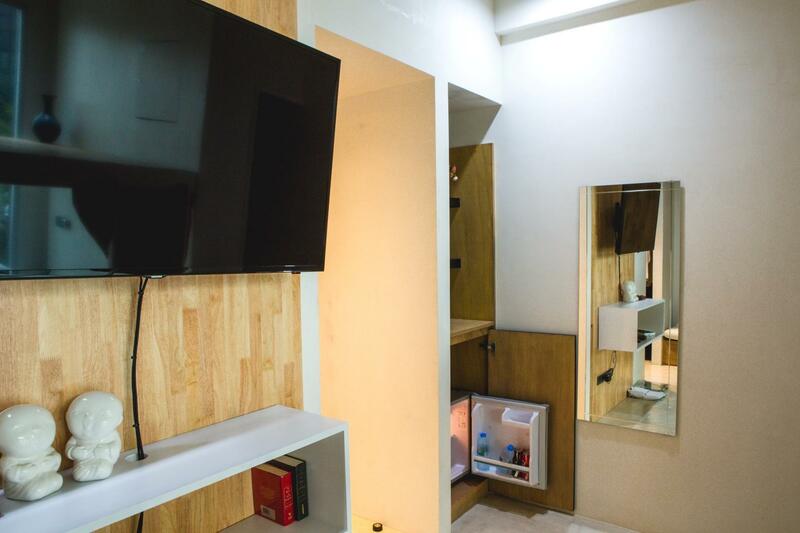 All of the rooms have air conditioning, an in-room safe box, towels, and a washing machine. The BOB Hostel provides a number of useful services, such as luggage storage and daily housekeeping. The front desk is open around the clock, ensuring that there is always a member of staff behind the desk to assist you whenever you may need. Thong Lo BTS Station is 1.1 km away and Ekkamai Bus Station is 1.2 km away. The nearest airports are Suvarnabhumi International Airport (BKK) and Don Mueang International Airport (DMK), which are 18.4 km and 20.6 km away. Check-in is offered from 03:00 PM and check-out is until 12:00 PM. 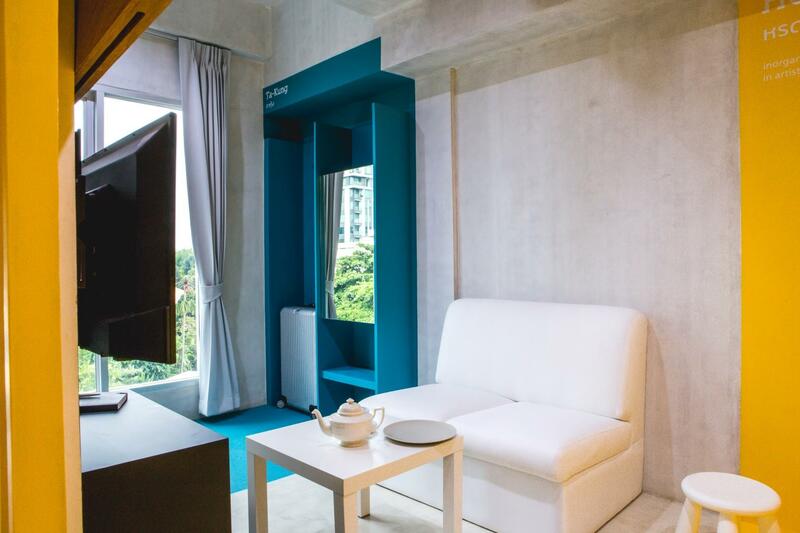 The BOB Hostel offers an express check in and check out service, allowing you to arrive and leave the hotel without waiting in line at the front desk. "The loft-style room was great with beds in the lower part of..."
Upon check in, noted the following: - Found half empty wine bottle in the room - potato chips - hair in the toilet Also: - door gets stuck, resulting in a loud screech when opening - no toilet paper Location: - far from nearest BTS. We booked the private room with to double bed adjacent to each other and a tea room on the top. We received another room not as described and its of lower price than what we paid for with the reason our particular room has air-condition issues. But the room we stayed had air-condition issue as well ; whatever setting put it will automatically switch back to 28c after some time. The stairs climbing to the bed is broken, not fixed and cellophane taped which pose great risk for heavier individuals The room has a very bad smell which a freshener they put couldn't cover and it won't go away. The floor is dark dirty and the sliding panel door near the bed isn't working as well. In conclusion I wouldn't recommend anyone to stay the family room. We booked the family room on the 3rd floor of the hostel and stayed there for two nights. The loft-style room was great with beds in the lower part of the bunk and a tea table on the upper part overlooking the skyline outside. The overall design of the hostel was very good. Tough we encountered some minor problems like a broken fridge and a broken bathtub drain, it wasn't a deal breaker. Thank you for your review. We will use every comment to improve our service. Thank you for staying with us. Hope you had a heap of fun on your trip. Safe travels. Loved staying at The BOB! I actually just kept extending and staying much longer than planned. Great location, very friendly staff and amazing value for money. 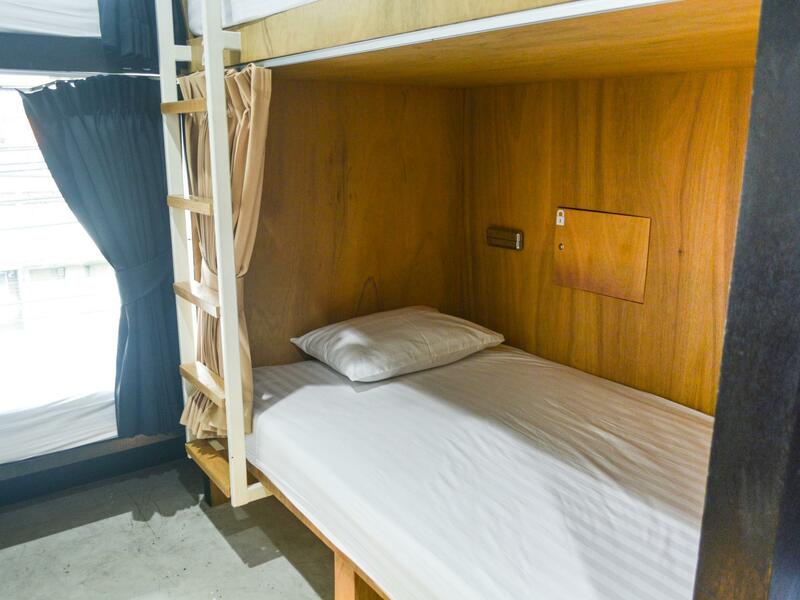 The dorm rooms kept clean and the capsules are very comfortable. There's a universal outlet and a usb charger in each capsule and a small locker, plus plenty of space to store the luggage. By now I've stayed in several other dorm accommodations in Bangkok and if ever back in Ekkamai area would most definitely stay here again. Thank you!!! Good place, good staff, good people, good bed, good rooftop... We had a really good time there ! The staffs are friendly and they are able to communicate in English. The place is clean and slippers are provided. 7-11 is just opposite the road at the corner. Lockers provided are too small, aren't really useful. Though airport transfer is stated available with the price stated at Agoda and it was one of my key consideration but they just replied no support for this service. I think this service should be removed from the Agoda website since they are not providing. The hostel is very confortable, nice design and very clean. The only minus point is that there is comfortable table or spot to sit, open a notebook and plan your day or next trip - we are in a long-term travel and we really value this type of offer. All the rest is grade 10! Receptionist is so nice and helpful. We reach around 9am, she help me keep all my belongings so I noneed to carry my luggage walking around. The hostel at 2nd floor is difficult to carry big luggage. The bed is so comfortable. Nice place to stay. Need more ventilation cause everyone their tower and some shoes in the room, abit smelly. 5 minutes walk to Big C. Very nice authentic local Thai food serve at 2nd floor. Cheap and nice. Mrt is too far if walk. Just take a bike cost only 20 to 30 bath. Take uberbike or grab bike to Siam paragon only cost 70 to 90 bath. They always give discount code. So cheap and convenient. Turn right to the small alley you'll find a small stall at roadside selling chicken noodle very nice and cheap. I've had a fantastic stay here. The 24 hour lobby is a bonus, although during Thai holidays, do expect them to be away from the desk. If you have a Thai Sim card, contacting the receptionists, if they are away, is not a problem at all! The location is also fantastic, it's a 10 minute walk from Ekkamai Station, which gets you to certain areas of Bangkok. We did a taxi/train combo when we needed to get to places, which is to be expected since Bangkok public transport is not great. The Bob Hostel has exceeded my own high expectations. I have stayed in some excellent hostels in Thailand over the years and Bob Hostel has to rank as one of them. Located on Ekkamai, it has a 7-eleven store just opposite and there's a Big C hypermarket and Healthland Massage Centre just a few doors away, so its really convenient. Ekkamat BTS station is just about 10 minutes walk away. As for cleanliless, this hostel is tidy and as clean as you can get since it's quite a new hostel. And what is most remarkable during my stay there is the helpfulness of its staff and also the friendliness of the young & handsome owner of the hostel. Special mention also goes to Ms Poppy for helping to make my stay there comfortable. And with that reasonable price, its definitely worth exploring and staying. Bring my dad n mom to experience hostel, their first time & they love it!!! We stay in a private family room with private bath room even with bath tub. Towel, hair dryer, shampoo & shower gel provided in room, how sweet. Love the view fm bed, fm roof top, and the whole hostel, look excatly in the photo, trust me!!! And It just newly open on late October/early November!!! And i saw shower gel n shampoo also provided for drom, washing machine n hair dryer for everyone share. For location, 7-11 is just opposite and many nice n good cafe are whithin walking distance(3-10min) Big C and healthland (for massage) also in walking distance (5min) not close to BTS Ekkamai (walk 20min) but u can just go by a cab. Anyway i love the Location, walking 10min u will reach the lively ThongLor street!!! Many restaurant and malls around that area. The down side is only there is no lift in the property, But those friend staff helped us with all of our luggage as we are in rush, thanks again!!! Fast check in and out, can speak well english, i will come bac again!! Keep it up!!! I remember the time when the staff there was friendly and the place was new and fancy. Now it was average. Good value for money, more privacy than in a dormitory but still something more to wish. When I was there I had noisy neighbours. Matresses were wrapped in plastic, which I think is a no-go (sweating, noisy). No facilities to hang out or make yourself something to eat (microwave is standing at the reception desk and that's about it), too bad there are not many cheap food options around, street kitchens are a bit tough to find, bar underneath was nice. Hostel was clean and quiet though and we'll designed. Wouldn't go there again since a) plastic covers and b) I look for more atmosphere where people exchange experiences and hang out together. The beds are so comfy!! I slept like fking snow white. The common are was bit small but the staff is just a bundle of joy; had a nice chat with them.